Oooh, I have an awesome new product to tell you about! 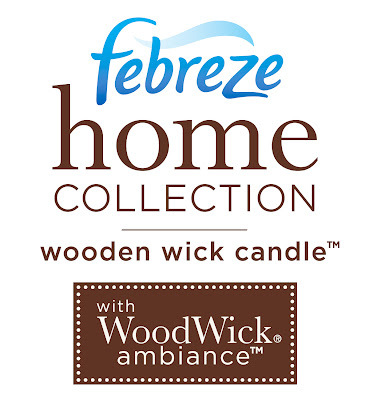 I had the pleasure to receive 3 of the new Febreze Home Collection Wooden Wick Candles to review! I know, what a hardship on me right? LOL It is always so awesome to get the opportunity to review a product from a company you love and I have been in love with Febreze products since they first hit the market! Where to start with all the fabulous features of these candles? First off the scents are AMAZING!! Seriously yummy! You know how some candles almost knock you over with some heavy cloying scent? Not the new Febreze Wooden wick Candles. The gorgeous fragrance just enhances your home. Here is the most awesome feature of these wonderful candles... They have a wooden wick! And they last up to 80 hours! 80 hours of Ahhhhhhhh! The calming crackle of a fire. I LOVE it!! I really am thankful to the folks at Febreze via MyBlogSpark for giving me the opportunity to try these candles! I am completely hooked on them! I think you guys are going to love them as well! Not only did I get the chance to try these new Febreze Wooden Wick candles, but the awesome people at Febreze want one of you to have the chance to try them for free as well!! Woohoo! 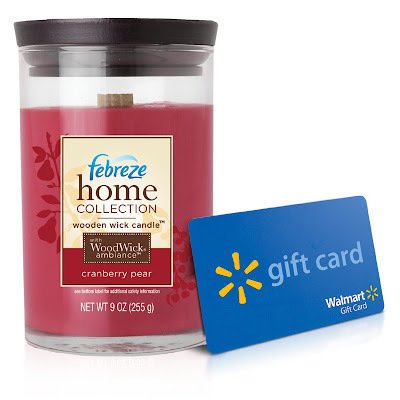 The folks from Febreze and MyBlogSpark have sent me a $15.00 Walmart Gift card to giveaway to one of my readers! 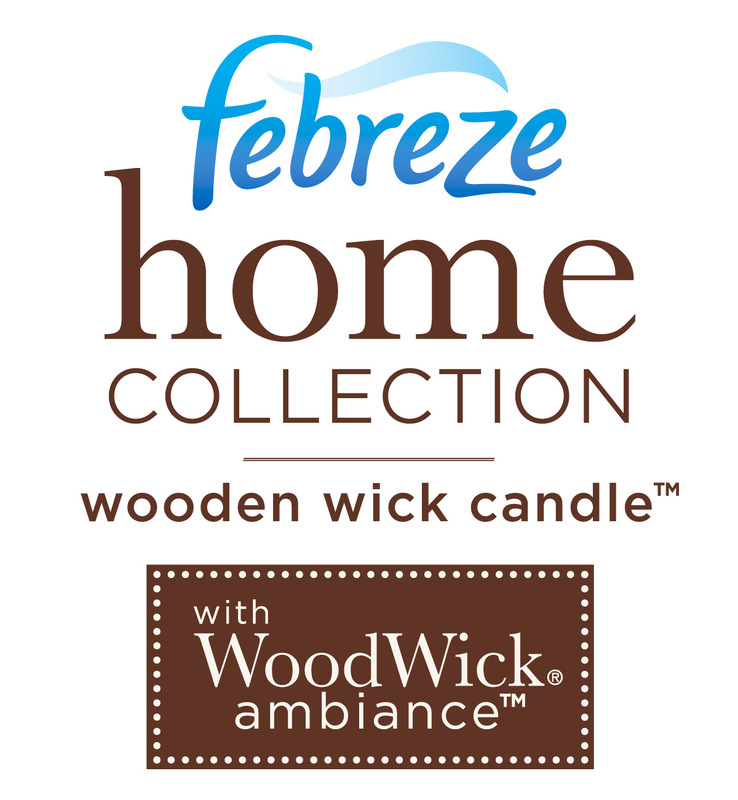 * Leave me a comment on this post telling me which scent you think you would love from the Febreze Wooden Wick Candle collection. The winner will have 48 hours to email me back after I send them an email announcing they won. Otherwise, a different winner will be selected. Thank you Febreze and MyBlogSpark! This product review was based on using complimentary Febreze product provided by P & G. I also received a Walmart gift card to share with one of my readers. P & G does not represent or warrant the accuracy of any statements or product claims made here, nor does it endorse any opinions expressed within this blogsite. All opinions are my own. No further compensation has been provided to me. Ooooh! YUM! Definitely would LOVE the gingersnap! I'd like to try the cranberry pear. I am a follower and I would love to win the gingersnap vanilla. I love candles and these sound wonderful. Diann, I'm a great big candle freak, so I really appreciated this review! Orange Honeycomb sounds like an intriguing scent that I'd like to try. Thanks so much for the chance to win your giveaway! Oh the Cranberry Pear sounds awesome to me!! I am one of your many friends on Facebook!!! I only recently was introduced to Woodwick candles. I love how they crackle. Would love to win your gift card. I am a faithful follower. Thanks-Happy Fall. I'd love to get the Willow Blossom scent. I think I would try cranberry/pear. I think I would like to try the new seasonal scent..the pear spice.. I'd love to try the Yumberry Sangria. I would love to try the Cranberry Pear. I've been a follower for a while already. I've been your fan on facebook for a while already. The Green Tea Citrus would be my pick. Thanks for the giveaway. Cranberry pear sounds delicious. Thanks for the chance. I'm NOW a follower. All this time I thought I was but I was just receiving your emails. Duh. I've got to figure all this out. Thanks again. Now I figure out how to do the FB thing. I would love cranberry pear. I have been a follower for a while. I love thrifting also. Cramberry Pear is for me. I would like to try the cranberry pear. Make mine Anjou Pear. It sounds like it would be nice. Thank you. You know I am a follower. Us dish ladies (avid collectors) have to stick together. Thanks for the chance at the giveaway. I'd like to try the Green Tea Citrus. I love the fruity and refreshing scent! And I am a follower here too! Thanks for the visit I do appreciate! sounds like it would smell awesome. We are on facebook together under a diff email.. I would love to try the Gingersnap Vanilla! I'd like to try the Willow Blossom! Anjour Spice sounds very yummy! ohhh, love walmart and febreeze! Hi Diann, thanks for the fun give-away! I'd like to try the orange honeycomb! The one I would like to try first would be Willow Blossom. I think I would like the Gingersnap Vanilla. It sounds like a unique scent. I am not sure you would call it following, but I read your blog every Saturday. Thanks for the giveaway! I would want the Gingersnap Vanilla. But the Orange Honeycomb sounds so good too. I just can't decide. I think Orange Honey comb, tho gingersnap vanilla sounds very nice too. Oops, yes I am a follower! I think I would like the vanilla gingersnap! I am glad to hear a review of these, thanks! Gree Tea Citrus sounds like a good one. orange honey has me curious! I am a new follower. I think orange honecomb scent sounds divine. Hi Diann, i think Gingersnap Vanilla sounds yummy. Count me in for the drawing. I too love febreze everything. BIG smile here. I hope I am lucky. Oooh...I was almost too late for your sweet giveaway...eeks! Thank you so much for hosting this for us...I love candles!!! I would love to try the Anjou Pear Spice...sounds heavenly!!! Well..not only am I a big fan of Febreeze (I use it all the time)...but I am also a big fan of you, dear lady!!! I have been a very delighted and faithful follower of The Thrifty Groove for sometime now!!! Gingersnap vanilla sounds like a great holiday scent. I'd like to try the Gingersnap Vanilla variety.